In a true sense it is impossible to set the exact date when the St. John The Baptist parish in Dundaff began because of the lack of complete records. The time and date of the celebration of the first Divine Liturgy in the church which was completed in 1938 is known but the history of the parish started a number of years before this. Before the building of the church there was a Molieben and before that prayers. Before the payers, dreams, before the dreams, a wish and before this, a need. The history of St. John the Baptist Church is similar to the history of hundreds of other such parishes organized in the United States between the years of 1910 and 1938. During these years, thousands of faithful Orthodox Christians left their homeland, their beloved parents, their friends and neighbors, and landed on the shores of this great land of America. They brought with them the ever-burning desire to establish a House of Worship in their newly-adopted country. Their love, ambition and faith in Almighty God and His Church gave them strength to overcome the unfamiliar customs, language, traditions and other great difficulties they had encountered. During the late 1920’s, a small number of Orthodox Christians from Austria and Galacia settled in the villages of Dundaff, Elkdale and Crystal Lake. They labored hard on their farms and in the mines. Being poor and having little means of transportation, they would walk to work and to nearby Orthodox Churches in Simpson and Jermyn in order to worship Almighty God. Their spiritual needs were cared for by the faithful and dedicated pastors of these parishes. Striving for the future and foreseeing the great need for their own church, a committee was formed for the purpose of establishing a parish. Meetings were held frequently and ways and means were sought to raise funds. As early as 1928 they received permission to use a local church in Dundaff for services. Vespers were celebrated on Sunday evenings by Reverend Basil Horsky, who was then pastor of St. Basil Church in Simpson. A very active founder of the parish, the late Thomas Mikolaichik, suggested the idea of putting on a play in order to raise funds. After sending away for books, he organized a small group who, after many long hours of practice and rehearsal, put on the production, “Russian Wedding”. The four hour play was presented at the Dundaff Inn in the Fall of 1933 before a crowd of several hundred. The production was a great success and the monies raised were used to purchase a parish cemetery. Very shortly thereafter, Thomas Mikolaichik died and was the first parishioner to be buried in the new cemetery. The late Michael Woytowich then offered a room in his home to be used for conducting divine services. The Divine Liturgy was held on those Sundays and Holy Days when a priest was available from one of the local Orthodox Churches or St. Tikhon’s Monastery. The were eighteen active families. During the month of July, 1934 the parishioners donated trees which were taken to a local mill and cut into lumber from which a hall was erected under the direction of George Chopiak. By holding dances and picnics and through rentals the hall was paid for within two years. On June 17, 1937 ground was broke for the building of a church. Through the dedicated and hard work of sixteen parishioners, the church was competed within one year. The first priest to serve in the new church was the late Hieromonk Myron Chabak from St. Tikhon’s Monastery. In the years that followed the parishioners continued to give of themselves both physically and materially donating such items as church appointments, vestments, banners, etc. Other churches also helped in furnishing the church. The parish has not grown much in the number of families as many have moved out of the immediate area. During the period between 1950 and 1960 the parish became quite inactive and did not have a permanent pastor. In 1960, with the assignment of Reverend Alexander Poshyvajko, once again parish life was reactivated and during the three years of his pastorship many things were accomplished. It was also during this time that the St. Olga Sisterhood was organized. In September, 1964 Reverend Joseph Swaiko (the present Metropolitan Herman) was assigned as pastor. During his pastorship much was accomplished, including the renovation of the church in preparation of the Thirty-Fifth Anniversary celebration. After his elevation and consecration to the episcopacy, care for the spiritual needs of St. John The Baptist Church was assigned to the clergy of St. Tikhon’s Monastery: Hieromonk Gamaliel, Hieromonk Sebastian, Reverend Michael Lepa, Reverend Thomas Jones, Reverend Mark Shinn and our present pastor, Very Reverend Father Dionysius Swencki. twenty five years and under his leadership our Parish has experienced a steady and full Liturgical life. We have undertaken a total church renovation program that has included, new altar tables, restoration of all interior church woodwork, pews and hardwood floors, complete painting, decorating and stencil art of walls and ceilings, new iconography which includes, icons of the Resurrection and Christ in Garden of Gethsemane in the Altar and a completely carved wooden Iconostas (Icon Screen) with all newly painted Icons from Eikona Studios in Ohio. Iconographer Christina Uveges has completed all of these icons in our ancient Byzantine style and has finished work on the icons of the American Saints that adorn the remainder of the church body. Work is also continuing on our Church Hall that includes new windows, siding and doors, and a new handicapped bathroom. Other plans include further work to upgrade the hall so as to continue to have a meeting place as well as a forum for raising funds for the Church. We, the parishioners of St. John the Baptist Church in Dundaff, although small in comparison to most other churches, are proud of what we have and our accomplishments. We know that we did not do it alone and we give thanks to Almighty God for His Blessings, those priests that have served us, our neighboring parishes: SS. Peter and Paul Church, Uniondale; St. 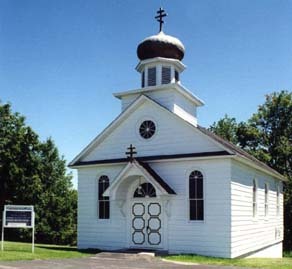 Basil Church, Simpson; St. Michael Church, Jermyn; St. John the Baptist Church, Mayfield; the parishes of the Wilkes-Barre Deanery, and especially the Brotherhood of St. Tikhon’s Monastery and the Faculty and Student Body of St. Tikhon’s Seminary who from the beginning until today continue to show their love and care by offering their help where and when possible. It was not possible to compile a complete history of the church. In-so-far that records were not preserved, we relied upon the memory of the older parishioners and thus, unintentionally, many activities, names and donations were omitted. Although not listed individually, all of the early founders and those parishioners who labor today, are to be commended for a job well done. Nearly all outstanding person are named in the records kept in the archives of the church and certainly in the hearts of all who knew them.